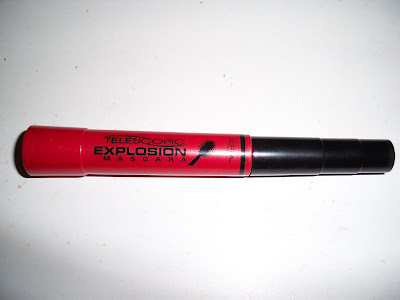 I purchased the L'oreal Telescopic Explosion Mascara at Walmart a couple weeks ago. It was on sale for $7.99 and decided, why not? I have always been very curious about the Givenchy Phenomen'eyes mascara, mainly because the little round, spikey ball at the end of the wand seemed so odd, and yet so inventive! 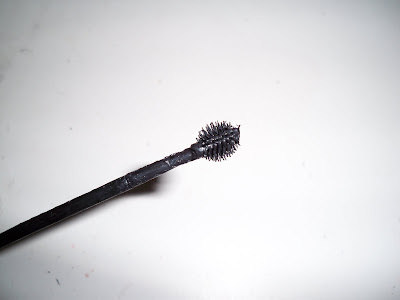 The basic concept of the brush is that all the little spikes can reach to coat every single lash, even the hard to reach ones in the corners of the eyes. On the package, L'oreal claims that this mascara will "lengthen, thicken, and separate 100% of lashes." I wasn't sure how to use the wand at first, but the instructions say that you can either hold the brush vertically OR horizontally...hence, being able to coat every single lash. At first, i hated this mascara! I typically prefer volumizing formulas over lengthening ones, and this one definitely isn't volumizing in my opinion. But after about the third use, I actually got the hang of the wand, and I realized that this mascara is actually really good at lengthening, and opening up the eyes. And it's a lot less expensive than the Givenchy version, although I have never tried that one so I can't compare the two formulas. ~Pros~ Lengthens the lashes very well, retains lash curl moderately well. I didn't notice any flaking or smudging throughout the day. It is also a fun concept. I got mine in the color "blackest black" and it is very dark, which I love. Also inexpensive, especially on sale. ~Cons~ The wand takes some getting used to. This isn't the easiest mascara to just throw on, you have to be patient. Not very volumizing. Frankly, there are better drugstore mascaras out on the market. My favorite for lengthening: L'oreal Double Extend Beauty Tubes. My favorite for volumizing: CG Lash Blast. ~Verdict~ Overall, I am glad that I went for it and tried this mascara. I wanted to see for myself what all the hype was about. This isn't a bad mascara, and I will continue to use it. But I probably won't repurchase. There are simply better mascaras out there. Sorry for the mixed review! I hope I am not confusing anyone, but this was a hard one! I have mixed feelings about it. I don't love it, but I don't hate it either ; I suggest trying it if it's on sale, or buy one get one at your local drugstore! This mascara sure looks strange! I'm not sure I want to give it a try. Thanks for the review!